IAM Executive Council Members, holding the banner from left to right, Eastern Territory GVP Lynn Tucker, Jr., GVP Diane Babineaux, Midwest Territory GVP Philip Gruber, GST Robert Roach, Jr., International President Tom Buffenbarger, and GVP Dora Cervantes, fourth from right, led a contingent of IAM members to the 50th anniversary celebration of the 1963 March on Washington. The continued quest to realize Dr. Martin Luther King Jr.’s vision outlined in his famous “I Have a Dream” speech drew tens of thousands from across the country to commemorate the 50th anniversary of the 1963 March on Washington. The IAM joined the throng from the civil rights, labor and religious communities to remind the nation that the struggle continues for the same issues outlined by King and the original 1963 march organizers A. Philip Randolph and Bayard Rustin – political and economic equality, jobs and the right to vote. Click here to watch a video of the 2013 March on Washington and here to view a gallery of photos. The event, sponsored by the Rev. Al Sharpton’s National Action Network, Martin Luther King III and the NAACP, featured a roster of speakers who spoke from the steps where King once stood, including representatives from labor who stood shoulder-to-shoulder with human and civil rights leaders, just as they did 50 years ago. Speakers included AFL-CIO Executive Vice President Arlene Holt Baker, American Federation of Teachers President Randi Weingarten, and American Federation of State, County and Municipal Employees President Lee Saunders. Former Southern Christian Leadership Conference President Rev. Joseph Lowery, Attorney General Eric Holder, House Minority Leader Nancy Pelosi (D-CA) and Rep. John Lewis (D-GA), the youngest speaker at the rally 50 years ago, also addressed the crowd. King, Sharpton and many speakers expressed outrage over the recent high court decision to gut the landmark 1965 Voting Rights Act. 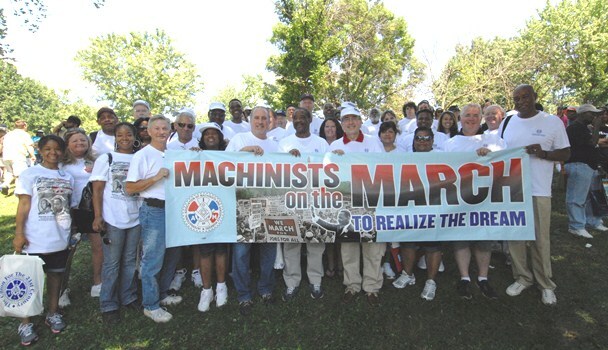 “Thank you to all of the IAM members who attended this march. We are proud of all those who took the time to be a part of this historic event,” said Buffenbarger on behalf of himself, IAM General Secretary-Treasurer Robert Roach and the entire IAM Executive Council.